“Morocco was eligible for the first time,” Applegarth said. He added that Morocco was selected in recognition of the government's efforts to fight corruption, reduce poverty, encourage freedom of press, and improve its human rights record." Morocco is invited to submit a proposal for assistance, which MCC will evaluate, based on its potential to improve economic growth and reduce poverty, the quality of the consultative process that guided the development of the proposal, and the country's commitment to continued policy improvement. No specific amount is yet decided for Morocco's grant. “Morocco could get zero dollars as he could get up to $100 million. All depends on the quality of the proposal Morocco will deliver,” Applegarth told Morocco Times. 82 candidates competed for this account, of which only 16 were selected. These include: Armenia, Benin, Bolivia, Georgia, Ghana, Honduras, Lesotho, Madagascar, Mali, Mongolia, Morocco, Mozambique, Nicaragua, Senegal, Sri Lanka, and Vanuatu. The countries eligible for this year's Threshold Program include: Burkina Faso, Guyana, Malawi, Paraguay, Philippines, and Zambia. Threshold countries do not qualify for the Millennium Challenge Account assistance, but have demonstrated a commitment to meeting the eligibility requirements for MCA assistance in the future. MCC is currently assessing 14 proposals and concept papers from countries that were eligible in 2004 Fiscal Year. Millennium Challenge Corporation is a US government corporation designed to work with some of the poorest countries in the world. The corporation, announced by George W. Bush in 2002, is based on the principle that aid is most effective when it reinforces sound political, economic, and social policies that promote poverty reduction through economic growth. 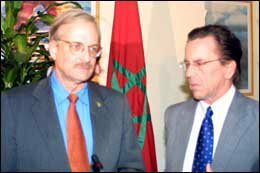 The press conference was attended by Thomas T. Riley, US Ambassador to Morocco, Roberto Powers, US Consul General, embassy officials, and journalists from both print and audiovisual media.